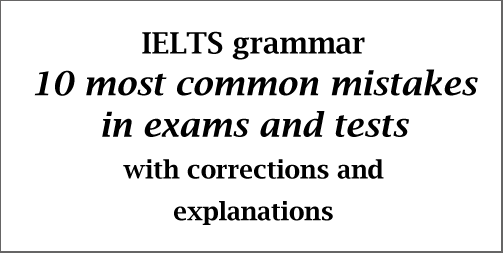 Candidates make a good number of mistakes in the IELTS exams due to their lacking in English Grammar. Studying regularly is important to understand grammatical rules and twists. Here are 10 most common or frequent grammatical mistakes found in different English language exams as well as job exams around the world. Take a look at the usage of singular and plural number, placement of prepositions, use of verbs in tenses, spelling errors, possessives, relative pronoun, double negatives and antecedents. The errors are quite frequent and so corrections are also provided along with the mistakes. I hope this post helps you. 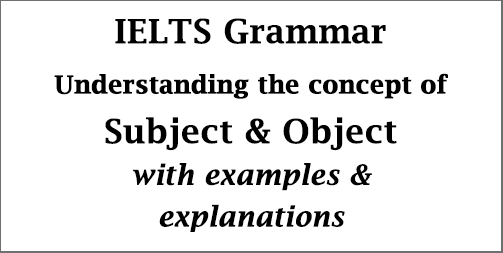 If you want to understand different rules of English Grammar, Subject and Object are some of the most important basic terms where you need a clear concept. They are also important to understand different complex sentences in IELTS Listening, Reading, Writing and Speaking. So, you should recognise, identify and use them appropriately. This post will help you to strengthen your ability to understanding of subject and object. Many IELTS candidates have requested me to give a post on ‘how to understand or recognize simple, compound and complex sentences’ in a very easy way. 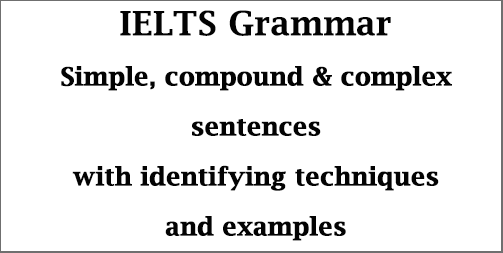 It is necessary for IELTS candidates not only to understand simple, compound and complex sentences but also know how to write them correctly. In IELTS Reading, they are used quite often; they are also important to get a higher band in IELTS Writing and Speaking. This post focuses on the understanding and uses of simple, compound and complex sentences. IELTS exam needs a bit of understanding of some grammatical rules for achieving a better score in all the four modules (Listening, Reading, Writing & Speaking). Preposition is one of the most confusing and elaborate section of English grammar. 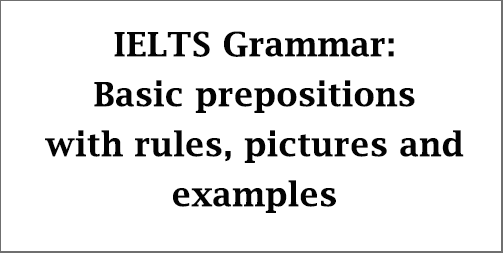 This post is intended to those candidates of IELTS and other English language exams who find it difficult to get a grip of prepositions easily. Most of the examples for these prepositions of time, place/ position and motion have been clarified here with the use of pictures. Please take a look at the examples for clear explanations. 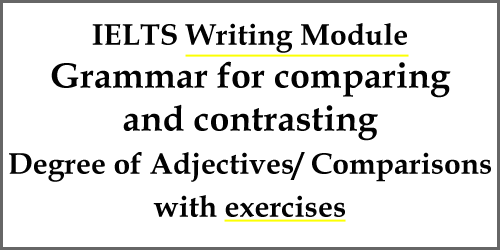 In IELTS Writing Module, having good skills in grammar can make a big difference. In this post, I’m focusing on a basic English grammar known as the degree of adjectives. You are aware that you need to write some sentences comparing and contrasting some figures in a pie chart, bar chart, and table, even in writing task 2. This post will massively help you to write different and catchy sentences with this language of comparison which will lead to a good band score. Like all other exams, Present Indefinite Tense is the most used tense in IELTS. It is mandatory for learners to have a clear concept of this basic grammar. 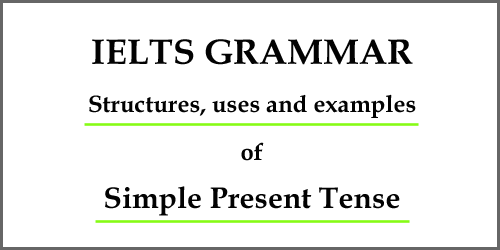 So, here is a detailed post explaining the structure, usage, and examples of Present Indefinite Tense which is also known as Simple Present Tense.